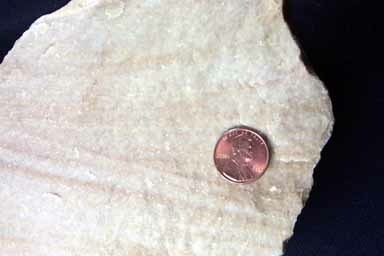 Pure, coarse grained quartz sand with cross bedding. The slight pink color staining along the cross bedding is iron contamination, and was not part of the original composition. The cross beds are probably large scale trough type resulting from the migration of large ripples. Pure quartz sandstones, especially when abundant, form in areas of great tectonic stability. This is because if any clastic sourcelands are available they will weather to produce at least shales, and possibly feldspars and lithics. Quartz sandstones are often associated with carbonate rocks. Quartz sandstone results from the extreme weathering and sorting of a sediment until everything that can be removed has been removed. Complete chemical weathering is required to remove all feldspars and lithics, but the final removal of the clay takes place in high energy environments, typically beach environments, although other high energy situations such as tidal sand bars can accumulate large bodies of quartz sand. Mature quartz sands such as this are not common in the geologic record because the required conditions are difficlt to achieve.